In the heyday of its incredible credit and construction boom, China was building two world-scale utility plants each week and opening up a new airport every day. Economic fiction writers like Goldman's Jim O'Neill, chief propagator of the BRICs myth, declared the Red Ponzi to be the very second coming of capitalism. That's what happened last year when China's richest man — at least on paper — lost half of his wealth in less than half an hour. It turned out that his company Hanergy may well just be Enron with Chinese characteristics: Its stock could only go up as long as it was borrowing money, and it could only borrow money as long as its stock was going up. Those kind of things work until they don't. The gentleman in question, Li Hejun, has had quite the financial spill. Exactly 400 days ago in April 2015, according to Forbes, he was worth $32.7 billion. Then on May 20 last year, when the stock of Hanergy Thin Film Power (HTF), in which he had a 81% stake, plunged by 47%, $14 billion of that disappeared in minutes. And since then, all the rest of it has vaporized, as well. Our purpose here is not to jitterbug on the corpse of another riches-to-rags story from the Red Ponzi. The fact is, Li Hejun and his Hanergy capers is China writ large. The latter is a incendiary cauldron of financial madness that is destined to have a spectacular demise. And it will take the global economy and the gambling dens of Wall Street, London, Tokyo and the rest down with it. Yet the punters continue to frolic in the shallow waters of the market's daily chart-driven undulations, as if oblivious to the Great Red Shark fast approaching. Then again, having missed Fannie Mae, Freddie Mac, Lehman and AIG there is apparently no sign obvious enough to empty the financial beaches in a world of central bank driven Bubble Finance. ........ the first thing to know about Hanergy is that it's really two companies. There's the privately owned parent corporation Hanergy Group, and the publicly traded subsidiary Hanergy Thin Film Power (HTF). The latter, believe it or not, started out as a toymaker, somehow switched over to manufacturing solar panel parts, and was then bought by Hanergy Chairman Li Hejun. And that's when things really got strange. The majority of HTF's sales, you see, were to its now-parent company Hanergy — and supposedly at a 50 percent net profit margin! — but it wasn't actually getting paid, you know, money for them. It was just racking up receivables. Why? Well, the question answers itself. Hanergy must not have had the cash to pay HTF. Its factories were supposed to be putting solar panels together out of the parts it was getting from HTF, but they were barely running — if at all. Hedge-fund manager John Hempton didn't see anything going on at the one he paid a surprise visit to last year. It's hard to make money if you're not making things to sell. But it's a lot easier to borrow money and pretend that you're making it. 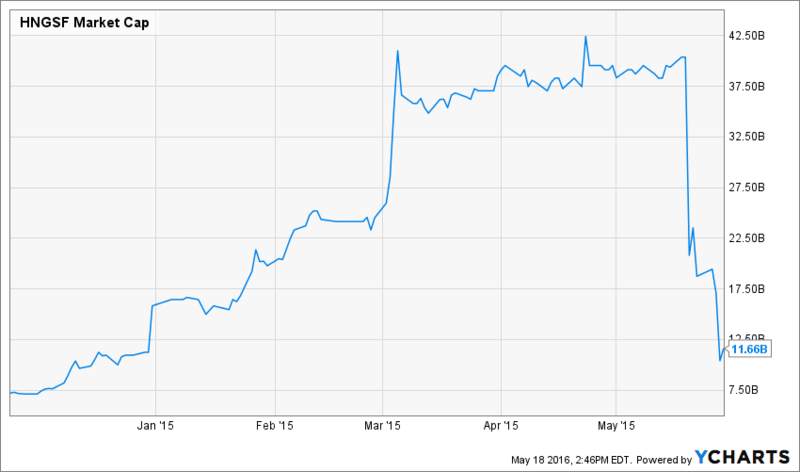 At least as long as you have the collateral to do so — which Hanergy did when HTF's stock was shooting up. Indeed, it increased 20-fold from the start of 2013 to the middle of 2015. And then it came crashing back to earth on May 20 when the ruse got exposed. That is, its market cap had gone from $5 billion to $42 billion in about five months, and then it was all given back in five minutes. In fact, the company presently has no market cap at all. It has been "suspended" from trading since last summer. Nevertheless, it is not just the the phony 8X gain at the beginning of 2015 that reveals the incendiary underside of the Red Ponzi. The more fantastic side of the story is how this stock was levitated by upwards of $35 billion in such a brief span of time. As the Washington Post story further explained, it all happened in the last 10 minutes of trading every day! Suppose you'd bought $1,000 of HTF stock every morning at 9 a.m. and sold it every afternoon at 3:30 p.m. from the beginning of 2013 to 2015. How much would you have made? Well, according to the Financial Times, the answer is nothing. You would have lost $365. If you'd waited until 3:50 p.m. to sell, though, that would have turned into a $285 gain. And if you'd been a little more patient and held on to the stock till the 4 p.m. close, you would have come out $7,430 ahead. (Those numbers don't include the stock's overnight changes). That's some pattern. And there's almost no way it could have been the result of chance. The most reasonable explanation is that someone was deliberately moving the stock up and up so that he could borrow more and more against it. Nobody knows who was behind it — at least not yet, but it's clear who benefited from high share prices the most: Hanergy Chairman Li Hejun. It turns out that China's very richest man at the time was posting his HTF shares as collateral for loans from the giant state owned banks and shadow banking lenders. He did some of it through off-shore subs, but when even that loan gravy train ran out there was no place to hide. Lenders were forced to sell the company's shares that had been pledged for the loans, and in a matter of minutes the stock crashed and was subsequently suspended. ....... there isn't much of a company left. HTF has lost four times as much money as it's taken in over the past year, it can't even pay the rent for all of its offices, let alone its bonds, and Li just unloaded some of his shares on the private market for 97 percent less than they were worth at their peak. We have been contending for quite some time that China's so-called banking system is just an extension of the Beijing based state command and control machinery. It has virtually nothing to do with legitimate banking, and, in fact, is just a giant financial waterfall through which fiat credit is sluiced into the economy on a top down basis. Surely, the billions that were being pumped into the Hanergy ponzi-----in the face of what even a lending officer trainee could see was a stock rigging operation-----leaves no other conclusion. In fact, the parallel surge of the Shanghai stock market during approximately the same period was funded in exactly the same manner. 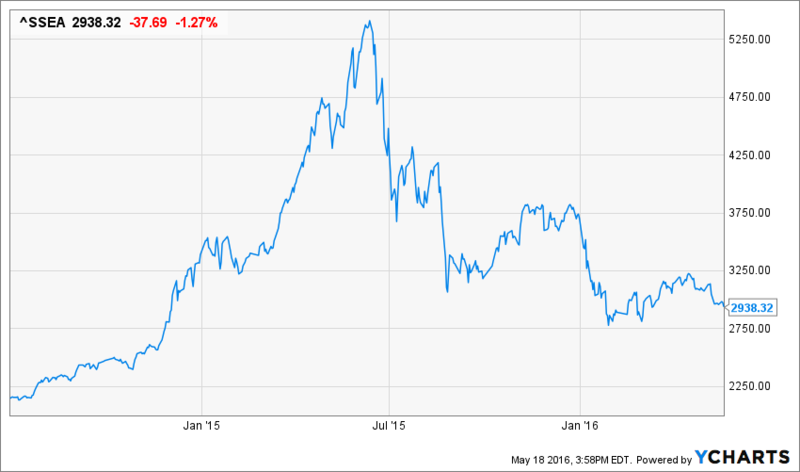 During the period between July 2014 and June 2015, when the Shanghai Index soared by 150%, margin lending exploded from $100 billion to $500 billion. Relative to China's ostensible GDP that was in the same ballpark as the eruption of margin lending which preceded the 1929 stock crash in New York. Indeed, at the peak of the stock frenzy last June, Chinese gamblers had opened 389 million stock trading accounts------one for every man, woman and child in America with 60 million left over. And on top of conventional broker margin loans, the number of on-line P2P lending operations had surged from 100 in 2013 to upwards of 2500 by last year while credit outstanding had soared from virtually nothing to upwards of $100 billion in less than three years. The point is, after $30 trillion of debt issuance in less than two decades China has turned itself into a giant mob of speculators and gamblers. The place is dangerous not because it bought a rusted-out used aircraft carrier from the Ukraine a few years back; it threatens the world by virtue of a printing press that is so white hot that an implosion which will shake the global financial system is only a matter of when, not if. Still, to hear Wall Street tell it China's recent stock market crash was just a stray pitch in the far corner of the world's radar screen. Ostensibly it showed that China's infallible leaders had let one slip, but they would take aggressive corrective action, even if it meant outlawing stock sales and rounding up unpatriotic short-sellers in the paddy wagons. That they did, and more, but never mind. US exports to China account for less than 1% of GDP and US multinationals derive less than 2% of their net income from China. As Well Fargo's global economics team commented recently. Moreover, stability is the hallmark of Chinese economic policy, and the central bank has ample resources to maintain an orderly pace of currency adjustment. In short, we believe that the economic and financial fallout on the US economy from the downward adjustment in the value of the Chinese currency will be limited. Right. The very same Beijing authorities who are ostensibly the paragons of financial stability presided over a stock market run that generated $5 trillion of bottled air in a few months and then destroyed it in a few weeks. Likewise, upwards of $1 trillion of flight capital has poured out of China in the last year alone, and more than $300 billion is parked in real estate in Sydney, Vancouver, California and elsewhere. But it's all under control. In fact, China just keeps repeating the same wild financial swings, but with rising amplitude and increasingly frequency. The incredible $4 trillion annualized run rate of new credit finance in Q1 incited a new outbreak of housing price inflation, and an even more explosive bout of commodity speculation. As to the latter, here is what happened to volumes on the Chinese Futures market in less than two months this year. At the peak of this new mania four weeks ago, the volume of iron ore futures traded in a single day, for example, exceeded annual consumption. Likewise, enough cotton was being traded on the futures market daily to make 20 billion shirts. Needless to say, the roving armies of punters who got smoked in the stock market last year have already been monkey-hammered in the commodity pits. Just as fast as they exploded in February, the price of iron ore, hot rolled coils and rebar has already plunged back to earth. But not until it caused China's massively overbuilt steel industry to fire-up idled plants and produce a record tonnage of steel in April------utterly unneeded inventory which is now flooding into the world steel market. Not coincidently, the US Commerce department has just announced a massive 520% anti-dumping levy on Chinese cold-rolled steel. And this is not a specialty product; its the heart of the steel market, and means that the global trade war ahead has already seen the first big shots fired. Even as some of the red punters where plunging into the commodity pits, however, it seems that much of the nation was back at the real estate gaming tables. China already has 70 million empty and massively over-valued apartment units as a consequence of earlier rounds of speculation, but that did not stop a new surge of real estate price inflation from spreading to virtually the entire country in a matter of weeks. 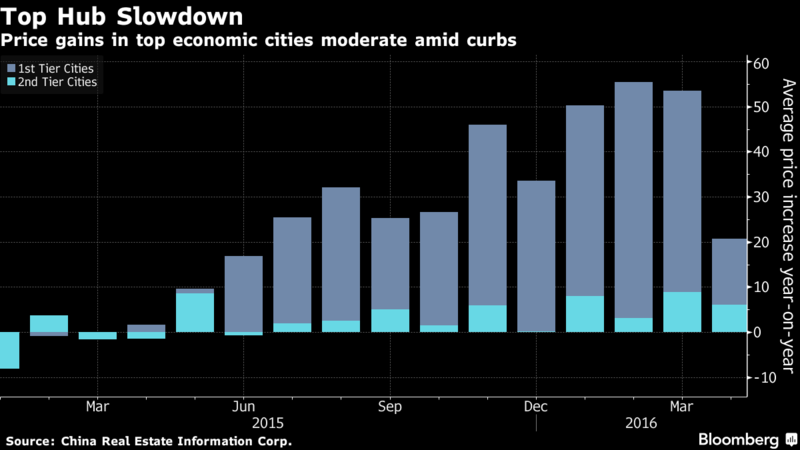 Home prices rose in the most Chinese cities in more than two years in April, with gains in second-tier cities surpassing advances in larger hubs. The gains were led by the Anhui province city of Hefei, where prices rose 5.7 percent, Xiamen and Nanjing, according to the official data. Prices rose 3.1 percent in Shanghai, a slower pace than in March, and 2.3 percent in the southern business hub of Shenzhen, the smallest gain in six months. They rose 2.7 percent in Beijing and 2.4 percent in Guangzhou. New home sales soared 63.5 percent to 793.7 billion yuan ($122 billion) in April from a year earlier, driving a rebound in real estate investments from the lowest level in 14 years. The average new-home price rose 1.03 percent in April from a month earlier, the fastest pace in six years, according to Bloomberg calculations based on government data. Existing-home prices increased in 51 cities in April from the previous month, compared to 54 in March. They declined in 10 cities and were unchanged in nine. Prices in April gained in 71 cities among the 100 tracked by SouFun Holdings Ltd., the owner of China’s biggest property website, compared with gains in 60 the previous month. Average new-home prices rose 1.45 percent, a slower pace than the 1.9 percent gain in March. The idea that the fallout from China's eventual crash landing won't spread to the rest of the world, including the US, is truly preposterous. 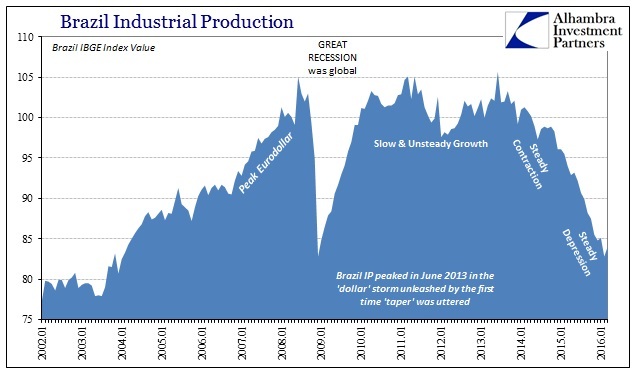 Let Brazil be the poster boy......or make that the Miami real estate market.......or the volume of exports going out of the Los Angeles/Long Beach terminal or new orders at freight car manufacturing plants in Texas or jobs at the Boeing plants in Seattle etc. With apologies to the great Bob Dylan, there is a hard red rain gonna fall.